Is it 10% fewer workers — or a 10% cut in payroll? I now think Corporate intends to whack 10% of payroll, rather than going after 3,000 jobs — my initial conclusion when I began posting early Tuesday afternoon. I reach that new conclusion after recalling this reader tip, two weeks before; it warned of a range of expense cuts under consideration, all in percentages. Based on payroll, Gannett could get to its targeted savings with less than 3,000 layoffs. All it need do is target higher-paid (translation: older, more experienced) employees. That’s likely how the Detroit Free Press and affiliates reached their target of 150 buyouts in July — with only 116 employees. In hindsight, I think Dickey simply put out a poorly worded memo, one ripe for misinterpretation. Since then, official Gannett spokeswoman Tara Connell has done little to clarify the confusion. Seeking damage control, according to one blogger, Connell told Bloomberg News, Reuters, MarketWatch, and anyone else (except, of course, me) who’d listen that the final number of jobs cut will be “substantially” lower than 3,000. Problem is, she wouldn’t say how much lower. Early reports from the field have only compounded the problem. Indianapolis Star Publisher Michael Kane reportedly told employees that his paper could lose 95 workers — about 9% of its workers. Since then, other readers have told me that one newspaper in the South, and another in a Western state, also are considering cuts equal to about 10% of workers — not payroll. I have little hope Connell will address this vital question further. I asked her for clarification soon after Dickey’s memo became public. More than three days later, I’m still waiting. Please post your replies in the comments section, below. To e-mail confidentially, write gannettblog[at]gmail[dot-com]; see Tipsters Anonymous Policy in the green sidebar, upper right. Friday | Oct. 31 | Got news, or a question? Part of an occasional series on how Gannett newspapers are preparing for an unprecedented layoff in early December. A reader says The Times in Shreveport, La., started talking about trying a three-section paper, instead of the usual four sections, a week or so ago. That was well before News Department chief Phil Currie began soliciting such ideas this week. How are you preparing for the 10% cut? Post replies in the comments section, below. E-mail gannettblog[at]gmail[dot-com]; see Tipsters Anonymous Policy in the green sidebar, upper right. Losses ‘n’ layoffs: Reeling from a second consecutive quarter of big revenue declines, Gannett announces plans to lay off 10% of its newspaper employees by early December. Job cut warning: CEO Craig Dubow reportedly discloses plans for more layoffs in as little as 10 weeks. My money hunt: Trying to keep Gannett Blog alive past Dec. 31, I launch an experiment nearly guaranteed to fail. October’s traffic mostly rose from the month before, final Google Analytics data show. Unique visitors (a tricky metric) climbed to 25,750 vs. 24,735 in September. Visits totaled 109,285 vs. 100,538. 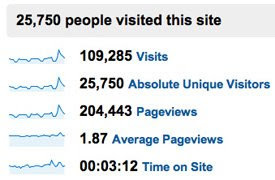 And page views climbed to about 204,443 from 207,480. Context: Gannett employs up to 46,000. Plus, top media industry blogger Jim Romenesko nabs 100,000 individual visitors a day. Makes a perfect holiday gift! Google Analytics has the traffic data, available in a free report I make available to anyone, via gannettblog[at]gmail[dot-com]. See Tipsters Anonymous Policy in the green sidebar, upper right. The editor’s request, and the employee’s secret work, was prompted by a teleconference on Wednesday, where News Department chief Phil Currie (left) began counseling top editors on how they will meet Corporate’s demand for a 10% staff reduction. Defying Neuharth, Gannett Blog endorses! Like rubbernecking past a car wreck, I can’t resist octogenarian retired CEO Al Neuharth‘s weekly column, every Friday in USA Today. No presidential election would be complete without Big Al reminding us — again and again! — how much he hates it when newspapers endorse candidates seeking election. But this year, we’re told, media bosses are finally taking cues from our favorite treehouse dwelling Floridian. “Newspapers making presidential editorial endorsements this year likely will be the lowest percentage ever,” Neuharth opines, without any discernible evidence backing that up. So, how does Gannett Blog‘s esteemed editorial board (that would be me) come down on the 2008 election? Why, we endorse — voting! My quick take on twin announcements yesterday by the board of directors, now that I’ve just arrived on the East Coast after a day of cross-country travel; I’ll try to come back with more later today. I’m a little surprised that Chairman and CEO Craig Dubow (left) would want to bring two new players on the board when there’s already so much upheaval in the company. But maybe that’s the point: He wanted more advice. Or, perhaps Dubow agreed to expand the board at the request of other directors. In any case, the board has now grown to 10 members. The board approved payment of another 40-cent dividend — punting, apparently, any decision about reducing the payout until a later time. Chief Financial Officer Gracia Martore suggested strongly last week that the dividend might be cut when the board met this week. Whether directors gave that serious consideration is unclear. Speculation about a dividend cut focused on Gannett’s unusually rich yield: nearly 15%. Investors were clearly happy with today’s news: GCI’s stock closed at $10.76 today, up 82 cents, or 8.3%. Thursday | Oct. 30 | Got news, or a question? Calling all exec editors: How are Currie meetings? I’m told that the News Department, led by Phil Currie and Kate Marymont, started holding teleconference meetings with top editors yesterday, to map out news coverage as the community papers prepare for the 10% job cuts disclosed this week. Executive editors: What are you hearing? Is there serious talk of dropping Monday editions? Please post your replies in the comments section, below. To e-mail confidentially, write gannettblog[at]gmail[dot-com]; see Tipsters Anonymous Policy in the green sidebar, upper right. I’m registered on the business social network as Jim Hopkins of Gannett Blog. You are currently browsing the Gannett Blog blog archives for October, 2008.